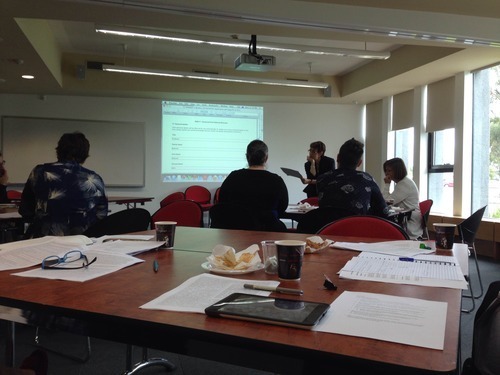 Last week I was privileged to spend a couple of days in an ARC (Australian Research Council) grant writing workshop led by Professor Janeen Baxter (UQ). We talked DECRAs, Discoveries, Linkages, and Future Fellowships. Janeen is currently a member of the ARC College of Experts for the Social, Behavioural and Economic Sciences (SBE) panel. This panel of 28 professors has a big say in how ARC funding in the social sciences is allocated, and they also determine which reviewers grant applications go to, so spending some time with Janeen was very valuable. I’m indebted to my colleague Kristin Natalier for arranging Janeen’s trip down to Launceston from Brisbane. As a newbie to this grant writing dance, which involves some moves that I’m not accustomed to, a few things struck me as I started to learn the steps. Here are a few of these insights and key points from the two-day workshop with Janeen. One of Janeen’s most important pieces of advice (and, I suspect, the hardest lesson to learn for us in the social sciences) is to be bold. If you want ARC funding, don’t say you are going to conduct an exploratory study into better understanding the problem or phenomenon you are interested in. Who cares about that? Instead, say how you are going to improve the world (or Australia, at least). What a coup! The trick, it seems, is to think beyond the immediate ‘outputs’ from your research, to imagine how your research might will have clear and significant applications. What are the broader social problems your research helps to address? What are the current panics or anxieties that circulate in a popular discourse that your research contributes to? It may be an awkward leap to make, but apparently it’s an important one. Any whif of hesitancy or meekness can really turn assessors off, it seems. This boldness has to permeate the application, from the title right through to performance evidence. It’s also important to say why your research needs to take place now, and why you and your institution are best suited to undertake this important research. ARC grant applications are usually assessed by two members of the College of Experts who will be in your general discipline but may not know your specific area of research. The ‘first carriage’ (lead member of the College) on your application will then assign your grant to up to seven ‘expert reviewers’ (five primary, and a couple of backups) based on the keywords you associate with your application. Just as with journal article reviews, it can be hit and miss as to whether or not your reviewers are knowledgable in and/or sympathetic to your research area, approach, and methods. So, you have to speak in a clear, plain language, free of jargon you might include in your more academic writing or even in lecture material. This is especially important in summaries which College members may be skimming to get through their pile of potentially hundreds of applications each year. There doesn’t appear to be much space, if any, for theoretical framing or backgrounds in grant applications. Broad, ‘common knowledge’ claims that appeal to an assessor’s sense of a problem or concern seem to be okay though. There is a strong preference in the grant assessment process for teams, made up of researchers with complementary (not identical) skills and strengths. This is most clearly the case for Discovery and Linkage projects, but even for DECRA applications a strong network of support and mentorship both within the institution and nationally is critical. Having a formal track record of co-authored publications with your collaborators helps, but even more informal collaborations like convening workshops together or team teaching can serve to demonstrate a working relationship. Do you really want to win an ARC grant? A competitive ARC grant application takes a whole lot of time and energy to put together. The success rates are also quite low: 13.9% for DECRA, 19.9% for Discovery, 16.3% for Future Fellowships, 39% for Linkage. There is clearly a ‘creative dance’ involved in being a competitive ARC grant applicant. Despite institutional imperatives to apply for these things, it’s not a dance for everyone. Tagged arc, grants, researchBookmark the permalink.